Silixa’s ArraySeis™ service improves ultimate recovery and enables efficient decision making by providing high-resolution seismic data throughout the life of well. The intelligent Distributed Acoustic Sensor (iDAS™), when coupled to an optical fibre, provides a versatile seismic acquisition platform capable of meeting many borehole seismic objectives. The optical fibre is placed in the well within a steel walled cable for protection, the cable can be clamped to the outside of production tubing, cemented into the casing annulus or conveyed into the well as a cable intervention. The optical fibre can be considered as an array of single component sensors aligned with the well-path and sensitive to the dynamic strain caused by incident energy. 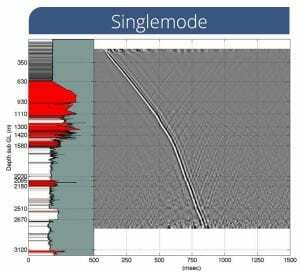 As a true acoustic sensor the phase fidelity and linear amplitude response of the iDAS make it possible to process acquired data using conventional seismic techniques allowing for rapid and seamless integration of iDAS Seismic into existing acquisition strategies. The distributed nature of the measurement means that each point along the fibre is sampled simultaneously for each source initiation, dramatically reducing the operating time required for a conventional survey and significantly increasing the achievable wellbore coverage for moving source surveys. 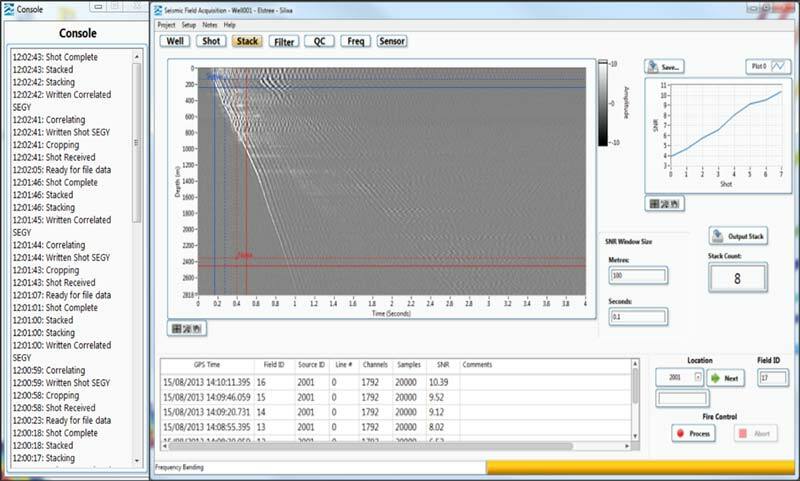 Using our SeiBer™ acquisition software, the iDAS can be used to trigger the source using a conventional controller, alternatively the iDAS can passively record the acoustic field continuously. In passive mode the iDAS performs in a sample-perfect manner ensuring that no samples are lost in the transition between data files and that zero-drift occurs relative to GPS time used to timestamp all data. Multi-well acquisition is made possible by synchronising multiple iDAS systems. Whether triggered or in passive acquisition mode the iDAS seismic platform can generate SEGY data files in the field when geometry information and source navigation and timing information is made available. When the optical fibre cable is permanently installed in the well, seismic acquisition can be performed without the need for well intervention and without stopping production, therefore offering significant savings to the operator and opening acquisition opportunities in existing wells otherwise not accessible to conventional borehole seismic techniques. A permanently installed cable also offers the ideal platform for time lapse seismic where channel depths are consistent from survey to survey. Silixa has utilised its expertise in DAS to invent a new way to significantly improve the signal to noise ratio of its measurements. iDAS natively measures strain rate. Geophone equivalent processing converts this into units proportional to axial particle velocity equivalent to the output of a geophone. This also flattens the noise spectrum. The quality and density of seismic data acquired with the iDAS means that processed image quality can rival, and often exceed that of conventional geophone acquisition. 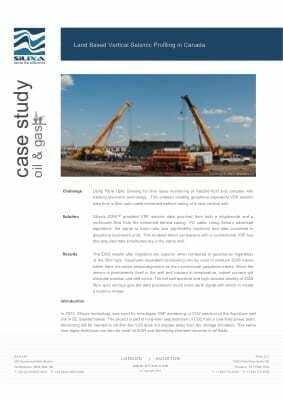 Silixa have built a track record of seismic acquisition in a diverse range of well types, installation methods, source conventions and survey designs and have co-authored, or featured in, a number of technical papers and articles on the subject. This animation above shows intersecting slices through a 3D image processed from iDAS seismic data acquired with the dynamite shot pattern indicated by the blue dots at the surface. The iDAS records the seismic signal at every point along the optical fibre with each source activation leading to much greater receiver coverage than is achievable with conventional borehole seismic methods. When data is stacked through migration the dense spatial sampling provides much improved SNR. The result is a high-resolution, high-quality image around the wellbore. This animation shows two intersecting images processed from iDAS seismic data acquired with the dynamite shot pattern indicated. The iDAS records the seismic signal at every point along the optical fibre with each source activation leading to much greater receiver coverage than is achievable with conventional borehole seismic methods. The result is a processed image which benefits significantly in SNR improvements through the migration of data with such dense spatial sampling. Uniquely the iDAS can operate on both singlemode and multimode optical fibres with no loss of performance and without the need to introduce additional apparatus, the implications of this are that wells with installed multimode fibres for Distributed Temperature Sensing (DTS) become viable candidates for iDAS seismic surveys. Distributed acoustic sensing is typically associated with singlemode optical fibres whereas distributed temperature sensing is associated with multimode fibres. Silixa’s iDAS offers the flexibility to operate on singlemode or on multimode fibre without the introduction of any external or additional apparatus, with no loss of signal quality and while preserving the true acoustic nature of the measurement. The examples above show simultaneously recorded data from co-located singlemode and multimode fibres.